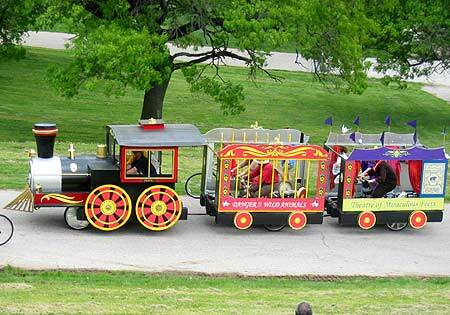 The most innovative design of 2004 was the Cirque de Sore Legs, a 3-car circus train from Frank Conlan and the gang who brought us the the Mad Hatter's Teapot in 2003. 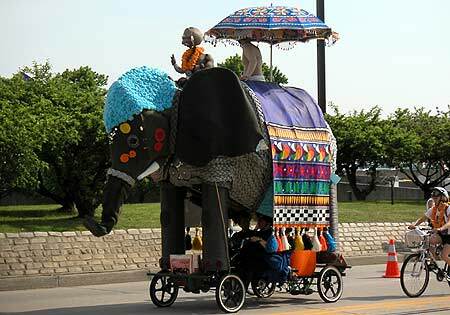 The engine included a bell and smokestack (complete with smoke) and two engineers; the second car contained a lion tamer and a lion (and looked just like a giant, amphibious box of animal crackers); and the third car contained a showgirl and a circus bear. Not surprisingly, they won the People's Choice Award. The eminent Hobart Brown also selected the Cirque for the Spirit of the Glorious Founder Award. Things really got exciting for the Cirque at the Canton water loop. They started out just fine, chugging alongside the pier. Then from nowhere came a great, sustained gust of wind, and she went off course. 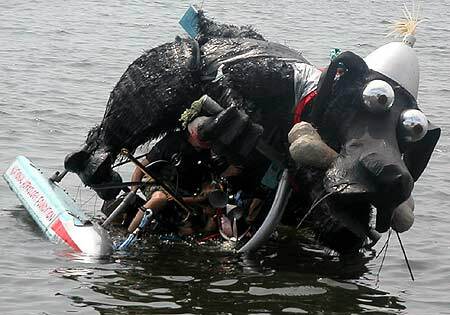 So far off course that they were the first sculpture needing rescue since Fifi headed for sea in 2001. 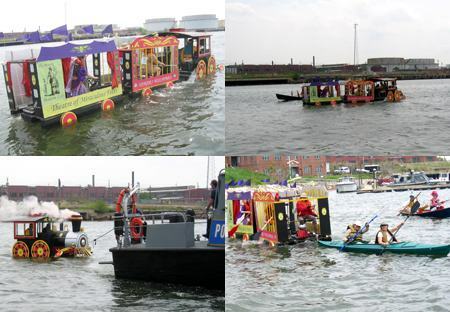 The Baltimore Police were on the scene and tied a line to the engine to tow her back to port. But then the train broke apart! The police towed the engine while kayakers Jack Boyson and Kathryn Shulman pulled the rest of the train to safety. If trains had keels, this mayhem might have been avoided, but of course keels would damage the tracks. 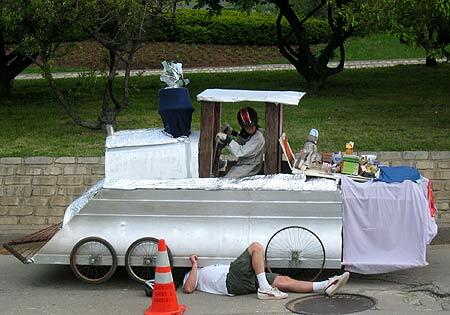 For providing the most exciting moment of the race, the Cirque also won the Golden Dinosaur Award, for the most memorable breakdown. The Coo Koos from Towson University had incredible costumes to go with their roving nest, complete with eggs and a motivational worm on a stick. 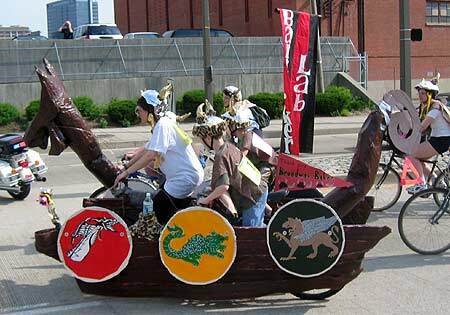 They won the Art Award for the most artistic presentation, the Best Costumes Award for their outlandish avian getups, and the Pilots' Choice Award for impressing the other pilots with their amazing spirit. 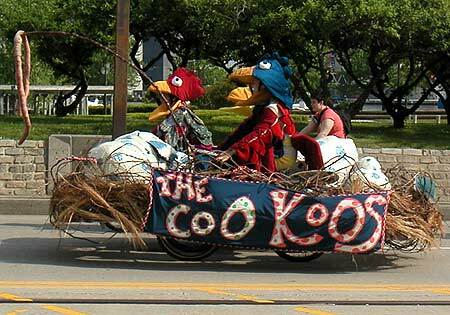 Come back next year, Coo Koos! 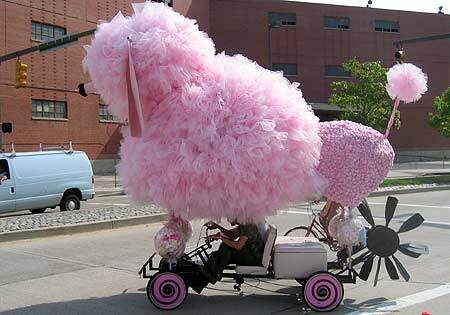 AVAM's Fifi was back in grand style, having gotten a brand new bright pink coat, and a massive new set of water paddles. She got down and dirty in the mud this year (with the help of her pit crew pushing); in previous years, her team laid rolls of pink bubble wrap atop the mud to keep her precious pink feet unspoilt. Fifi won the Best Bribes Award when two of her crew serenaded the judges on bended knee. 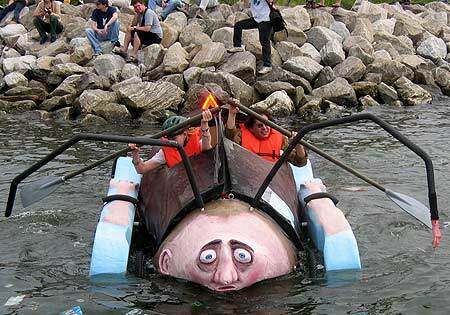 The Franklin and Marshall College of Lancaster, Pennsylvania entered La Kafkaracha, demonstrating Kafka's The Metamorphisis in amphibious sculpture form--half-cockroach, half-human. The water comes up to a perfect level on the vehicle's expressive face. It was a little hard to steer on the water, as evidenced by their peculiar orientation in this photo, but the wind proved a challenge to many a sculpture that day. This Valking Viscar Boot sculpture looked like an amphibious wooden boat. At the start it made painful clacking sounds while lurching down Key Highway. The propulsion system apparently had serious difficulties, for its pilots pushed it along by manually cranking the wheels with their arms (ugh! ), and even on the negligible incline of Key Highway it needed a tow with ropes. It was optimized for water, however--the keel proved valuable on the water at Canton Point. They were awarded the Worst Honorable Mention, for "half-baked theoretical 'engineering' which did not deter its Pilot from the challenge of the race". Created by the Valley Academy and Jemicy School of Towson; we hope to see you again next year! Louie the Dog returned for a second year, and for most of the race was far out ahead of all the other sculptures--this pooch can really cruise! On the water at Canton Point, he seemed extremely stable for most of his trip into the water. 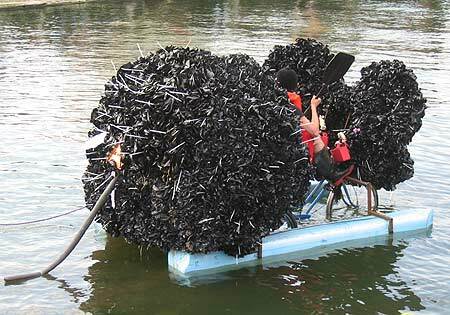 However, he was more heavily loaded than last year and suffered from the Pontoon Effect. He very nearly capsized with one pontoon mostly out of the water. But thanks to the valiant efforts of his pilots, he regained his balance and paddled back to shore. Way to go Louie! By David and Eli Hess of Phoenix, Maryland. For his amazing dip, Louie won the Golden Flipper Award. 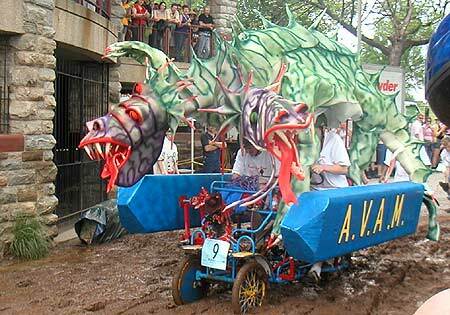 The Two-Headed Dragon won the Best Pit Crew Award, but for the life of me I don't remember why. (If you know, please use the link at the bottom of the page to tell me!) The light painted foam and double-head design were classic. For their miniature dragon sculpture (just above the number "9" in the photo), they won the Sock Creature of the Universe Award. 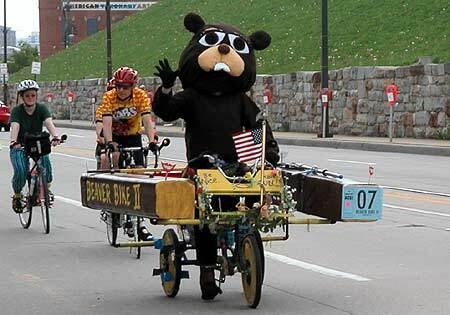 Jimbo Hanson of Woodstock, New York, brought back his Beaver Bike II, and the weather was clement enough that he got a chance to wear the beaver suit this year! For his stellar design, he won the Speed Award for finishing faster than any other sculpture, and also an Ace Pilot Award for finishing the race without any assistance from ropes, pushing, towing, or other external effort, on land, sea, sand, and mud! 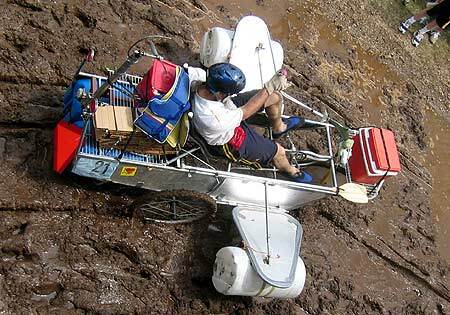 The other Ace Pilot Award went to Kinetic Airways, for another simple but highly effective airplane design wrapped around a recumbent bicycle chassis. You can't see the jet engines painted on the front of the "engines" under the wings in this photo, and you can barely make out the mandatory sock puppet behind his cooler. Theadora Brack of Paris, France, brought back the Rat, with a new waterproof coat of plastic tufts. 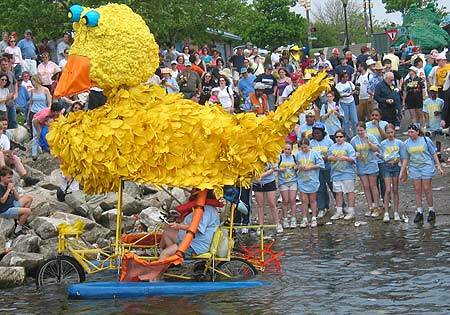 (The fur coat last year was quite a sponge in the aqueous portion of the race.) The Rat won the Next-To-Last Award for coming in right near the end of the race. 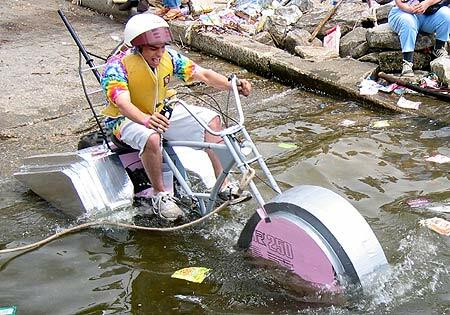 One Beer Short of a Six-Pack was the title of this one-person sculpture that cleverly used buoyant fenders for floatation. It's from Towson University. 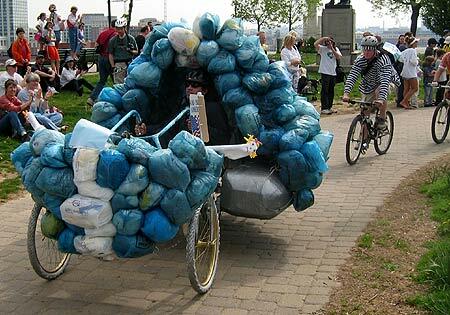 Also from Towson University was Papa's Got a Brand New Bag, whose peculiar shell is composed of bags stuffed with recyclable plastic grocery bags. 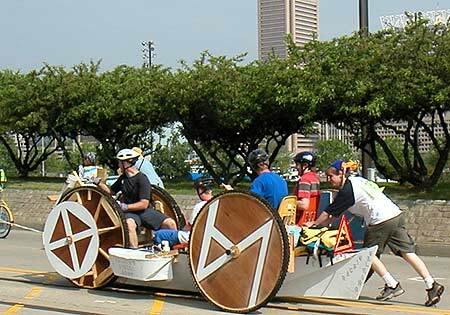 The first sculpture to break down was the Widget Mobile, the first entry from the Baltimore Museum of Industry. Its first breakdown happened mere feet from the starting line, and you can see Bumpo the Elephant eager to pass. They managed to fix the sculpture and get further in the race, but they didn't finish. We hope they submit another entry next year! The Baltimore Lab School Art Department submitted The Berserker, this Viking-themed sculpture. Tragically, just outside Hooter's on the Inner Harbor about 4 miles into the race, one of their axles broke on a rut, and they could not continue the race aboard their sculpture. 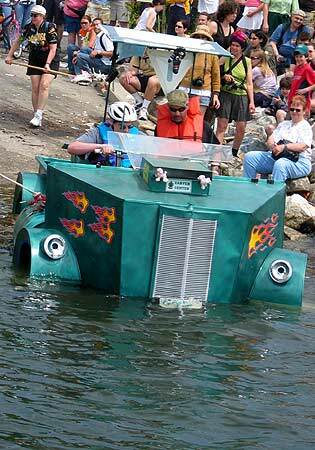 The Loco de Trash also broke down less than a mile into the race. That isn't a victim they've run over--it's one of the Dumpster Diver Kinetinauts surveying the situation to see if emergency repairs can be completed. It's not apparent in this photo, but the smokestack is actually a hat worn by a human riding inside the sculpture! Last year's champion, Bedlam returned with their blue and yellow motif. 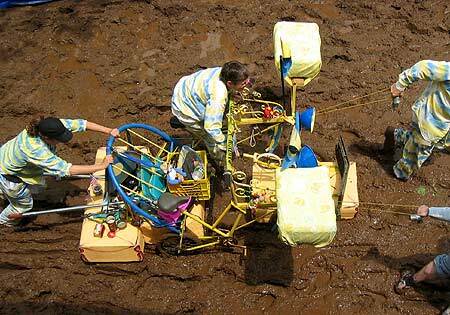 As you can see, they needed to dismount and heave to get through the mud, but they finished the race in style. Bedlam is created by Bobby Hansson and Bill Lepley of Chloe Fabricating, in Punxsatawney, Pennsylvania. 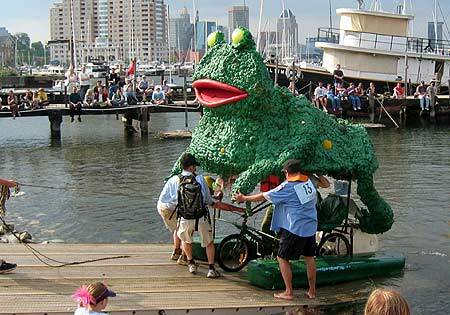 The Frog returned for a third year, and demonstrates its amphibious nature rolling out of the water at the Baltimore Museum of Industry. This year's photos were featured on Slashdot and Metafilter, among other places. 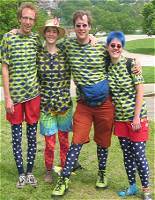 You can also see some great photos and descriptions of the race on Ellin Beltz's website.